P.S. 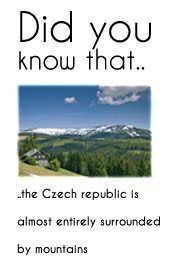 I am adding here photo from "Czech Switzerland". I have been there 3 days ago and it's really beautiful place! There is a wonder of the world called "Pravčická brána", but Czech Switzerland has a lot of mountains too. I walked to the top to see Pravčická brána 6 hours and it was 36°C, but it was really lovely day. I started at 13:00 and finished at 19:00, so I was on the one of the highest place in the Czech Republic and saw awesome sunset in pink-purple sky. Another day I visited Germany, because it's around 4 km's from there. If you're preparing to visit the Czech Republic, I highly recommend you this place. Learn Czech: How much does it cost?